Glenavon manager Gary Hamilton has questioned his players' 'lack of belief' when playing at home. Saturday's 2-0 Irish Premiership defeat by Cliftonville was the Lurgan Blues' fourth defeat in six matches at Mourneview Park in 2019. Hamilton is alarmed by their home form, particularly in attacking areas of the pitch, and has vowed to address it. "We lacked quality in the final third and it's becoming a bit of a habit at home," the player-manager said. "I can't remember the last time we played really well for 70, 80 or 90 minutes at Mourneview and, whether being at home is affecting the players, I don't know. "We will have to put that question to the players because our general play until the last third is very good. "But when we get to the final third at home it looks like we are lacking confidence and belief - it's certainly something that we need to start looking at." 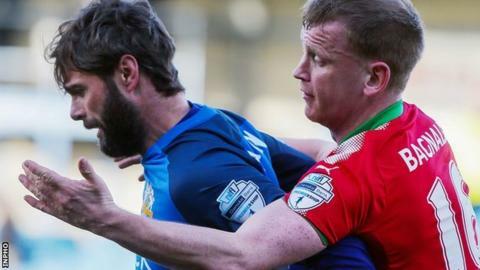 Glenavon went into Saturday's rearranged fixture with the Reds on the back of winning four points from two away games against Glentoran and Crusaders. That impressive away form has made their results at home even more frustrating for Hamilton. "With those two performances we should have been going into the Cliftonville match full of confidence and playing with freedom," the former Northern Ireland striker added. "Again, though, when we come back to Mourneview the boys seemed to lack confidence. It's as if the leash is taken off them when they go away from home and they can play more freely." After setting the early pace in the Irish Premiership, Glenavon are currently fourth in the table, 20 points behind Linfield, who come to Mourneview on Friday night. Before that the Lurgan Blues play Warrenpoint Town in the Mid-Ulster Cup final at Stangmore Park on Tuesday night.